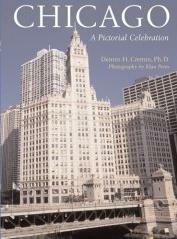 by Dennis H. Cremin, Ph.D.
What was once prairie land, is now the pulsating city of Chicago. Known for being a leader in manufacturing, banking, and culture, Chicago draws people from all over. This wonderful book pays testament to the colorful history of Chicago, and is illustrated with stunning photographs. Much of the young and upcoming city burned in the Great Fire of 1871, but was quick on the comeback trail. And what a comeback! It's now a vital link in this enormous country which boasts incredible transportation, exquisite architecture (take a ride on the river and get an up close and personal view of the gorgeous buildings), a superb buffet of ethnic restaurants, parks, theatre, music, Lake Michigan as its "front yard", and a host of other attractions. This book lists some of the best things to see when in this city, the Water Tower (my favorite because it's quaint and resembles a little castle) of which is just one. Chicago is also the starting point of the magnificent Route 66, on Adams Street, just off Michigan Avenue. The reflective Fourth Presbyterian Church is another attraction worth taking in. Chicago is an easy city to get around - I love walking the streets, and have done, for literally miles and miles at a time. See the other books in this series: Vancouver, Las Vegas, San Francisco and Los Angeles. Conclusion - Interesting history with beautiful photographs. An armchair traveler's delight.